Far from Arlington’s finest, the Lubber Run Trail nonetheless offers a pleasant, paved stroll through a pretty stream valley south of Ballston, Virginia. 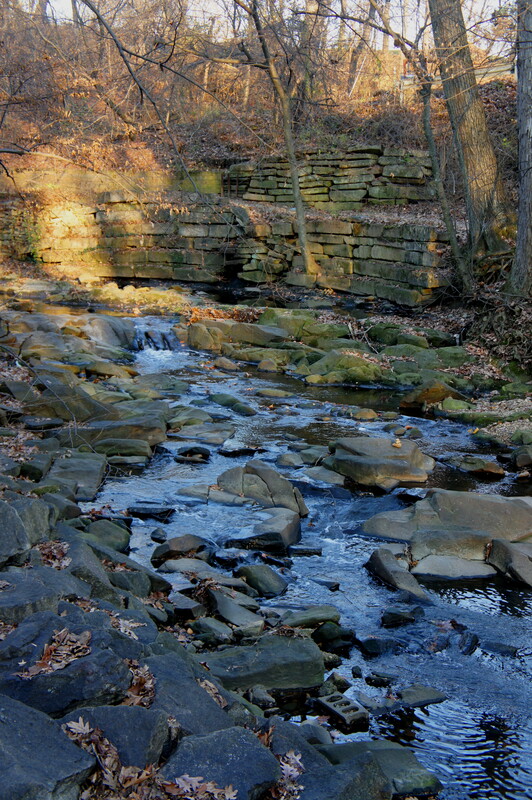 The namesake creek is flanked by thousands of gray stones, and a series of minor dips make for some trickling cascades. Picnic tables abound, and a gargantuan outdoor amphitheater marks roughly the halfway point between North George Mason Drive and Arlington Boulevard. 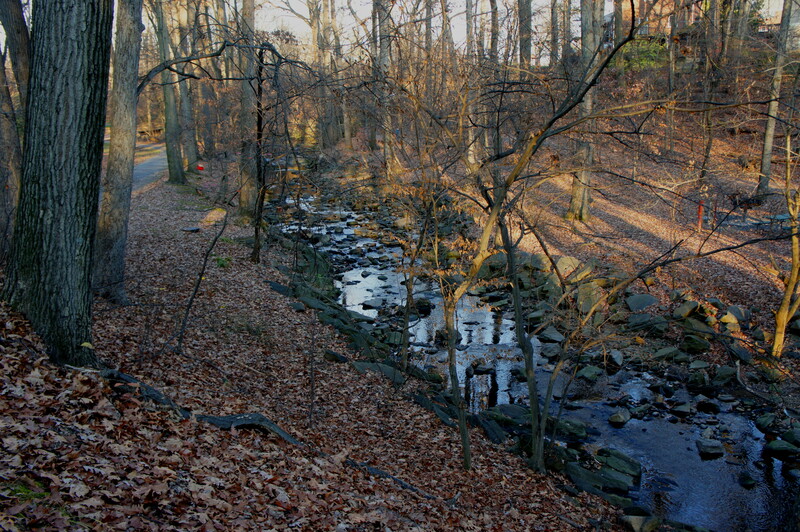 The northern terminus of the Lubber Run Trail is situated off North George Mason Drive just east of the intersection with North Carlin Springs Road. The start is hard to miss: a well-placed sign welcomes visitors to Lubber Run Park – continue straight ahead. (Note: A left turn takes one up the hill to the Lubber Run Community Center, playground, and basketball/volleyball courts.) The wide, paved path quickly crosses over a bridge, then runs along the west bank of Lubber Run; the opposite bend is flanked by a multi-tiered stone wall, perhaps the handiwork of masons at the conception of Lubber Run Park? Soon after the wall, the trail quickly climbs roughly 4-5 feet in elevation to clear a minor uplift, an ascent that could pose a challenge for visitors in a wheelchair. Soon after, however, the route levels out again, passing a spur trail leading over the creek to a picnic shelter with ten tables. 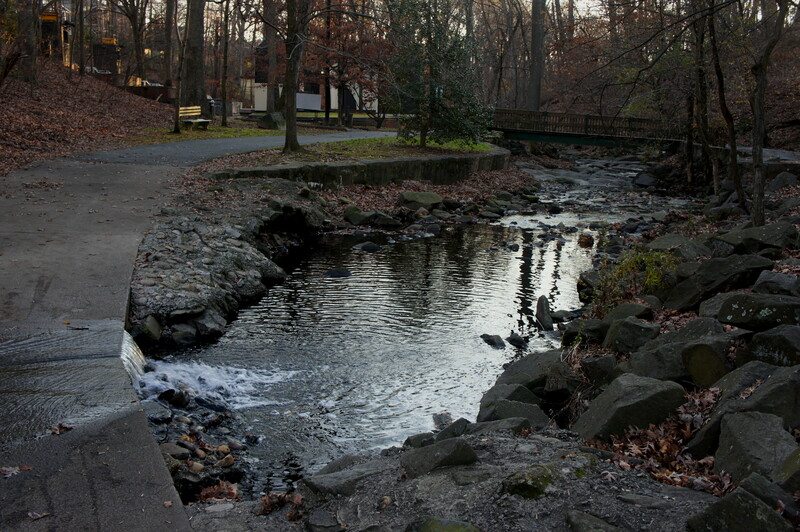 A minute later, the footpath approaches a curious intersection, where one must choose between a) crossing a cement berm over which the stream flows or b) bearing right, off the main trail, and cutting through a small picnic area before crossing a wood-railed bridge to the east bank of Lubber Run. There are a handful of very minor falls in this section. …Or you can return the way you came, following the paved path back to North George Mason Drive or cross the stream to the west bank, where a short, unpaved trail leads back to the funky intersection, after which the paved track offers the only option. 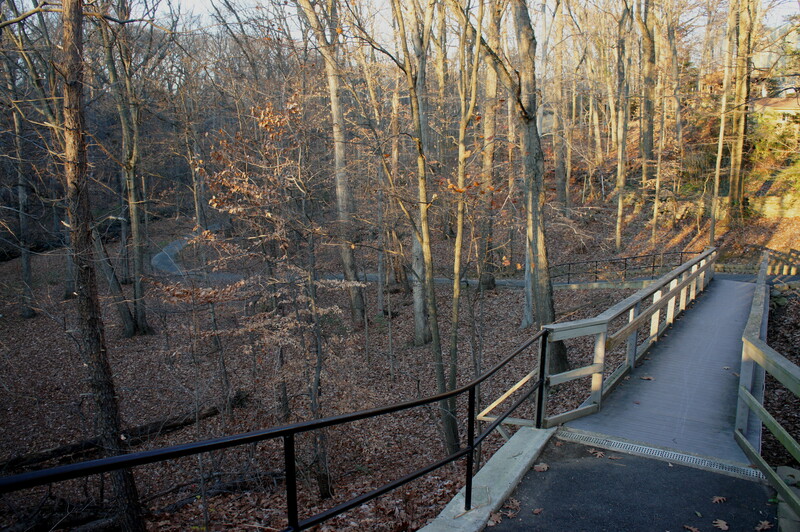 This entry was posted in Arlington County Parks, Easy Hikes, Virginia and tagged amphitheater, Arlington, Ballston, Lubber Run, Lubber Run Park, Lubber Run Trail, Virginia, wheelchair-accessible. Bookmark the permalink. Missing: actual map showing individual park terrain (e.g., location of amphitheatre, individual “paths”, etc Lovely website but useless when actually negotiating park on foot or bike . Always nice to know where you’re going. Ouch. I don’t always do maps because they can be difficult to put together upload and for some short trails it’s not really worth it. In this case, the description should be detailed enough that you don’t get lost. How much parking is available for summer concerts?